April 12th, 2019 Wilcox looks forward to serving on the Program Committee for the ACM CHI 2020 conference. She will be an Associate Chair on the Health subcommittee. 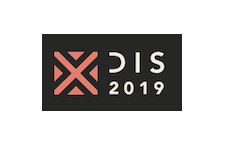 March 20th, 2019 Wilcox looks forward to presenting a paper at the ACM DIS 2019 conference. Abstract: Interaction design is playing an increasingly prominent role in computing research, while professional user experience roles expand. These forces drive the demand for more design instruction in HCI classrooms. In this paper, we distill the popular approaches to teaching design to undergraduate and graduate students of HCI. Through a review of existing research on design pedagogy, an international survey of 61 HCI educators, and an analysis of popular textbooks, we explore the prominent disciplinary perspectives that shape design education in the HCI classroom. We draw on our analyses to discuss the differences we see in forms of design taught, approaches to adapting design instruction in computing-based courses, and the tensions faced by instructors of these classes. We conclude by arguing for the importance of pedagogical research on design instruction as a vital and foundational area of inquiry in Interaction Design and HCI. The paper is co-authored by Betsy DiSalvo, Richard Henneman, and Qiaosi (Chelsea) Wang. Dec 5th, 2018 Wilcox looks forward to giving a talk at the Contemporary Challenges of AI in Healthcare: Verification, Big Data, and Investment conference at Emory University, December 14th & 15th. The conference is hosted by the Center for Ethics at Emory. Nov 26th, 2018 Matt Hong was selected to participate in the ACM CHI 2019 Doctoral Consortium. October 12th, 2018 Clayton Feustel presented work at the Ubicomp 2018 conference in Singapore. Our paper examines how people conducted personal and cohort data reviews using a subset of participants from a mobile-sensing study that collected physical activity, digital social activity, and perceived stress, from 47 students over three weeks. Participants preferred to use characteristics of the data (e.g., maxima, minima) and graphical presentation (e.g., appearance of trends) along with demographic identities (e.g., age, gender) when relating to cohorts. Our paper further characterizes how participants incorporated cohort data into their self-reflection process, and concludes with discussion of the implications for personal informatics systems that leverage the data of “people like me." Aug 24th, 2018 Wilcox participated in Principles of Intelligence: A Celebration of Colleagues and Collaboration at Microsoft Research. She gave a short talk titled, Uniting Digital Health Advancements with Human Needs. July 20th, 2018 Wilcox looks forward to visiting the Google AI Healthcare team in August to give her Grand Rounds talk: Care Machines: Lessons Learned from 10 Years of Studying Human Interactions with Health Data. 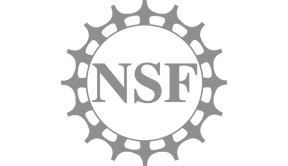 July 18th, 2018 Lauren Wilcox, Betsy DiSalvo, Thomas Ploetz, and David Joyner will collaborate on a new NSF award. The grant, Leveraging Behavioral and Physiological Feedback in the Design of Affect-Sensitive Distance Learning, investigates the feasibility of using wearable technologies and other types of sensing to gather more context about online learners. It will also explore the role of wearables in providing new types of feedback to multiple stakeholders participating in online courses. This write-up of the project explains more! May 17th, 2018 Who should have access to adolescents’ electronic personal health records? Our paper, now published in JAMIA, reveals reasons for variability in privacy features for adolescents and parental proxies. This study is part of a larger collaborative research effort with Marianne Sharko and Jessica Ancker at Weill Cornell Medical College, exploring current policies surrounding access to electronic health records of adolescents, and characterizing the capabilities needed to ensure privacy and confidentiality of adolescents' health data. This paper was selected as Editor's Choice. May 1st, 2018 Wilcox looks forward to co-chairing the Student Design Challenge at the AMIA 2018 Annual Symposium. April 13th, 2018 Wilcox attended the CCC event on Sociotechnical Interventions For Health Disparity Reduction held in conjunction with the Society of Behavioral Medicine's 39th Annual Meeting. 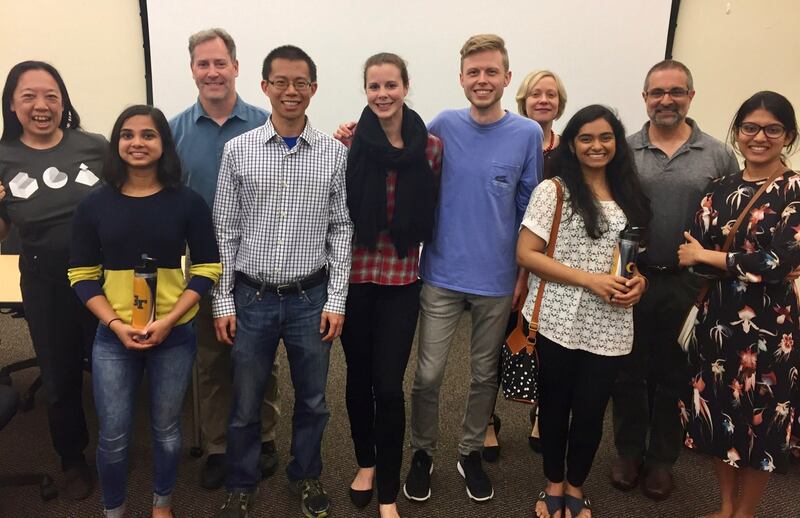 April 8th, 2018 Wilcox visited the Stanford HCI group to present a talk titled, Designing for teens' and young adults' engagement with digital health. March 29th, 2018 Wilcox is part of an ACM Future of Computing Academy (FCA) working group arguing for changes to the peer review process, to identify and address negative "side effects" of computing research. To spur discussion on this issue, Wilcox contributed to an ACM FCA blog post, titled It’s Time to Do Something: Mitigating the Negative Impacts of Computing Through a Change to the Peer Review Process. 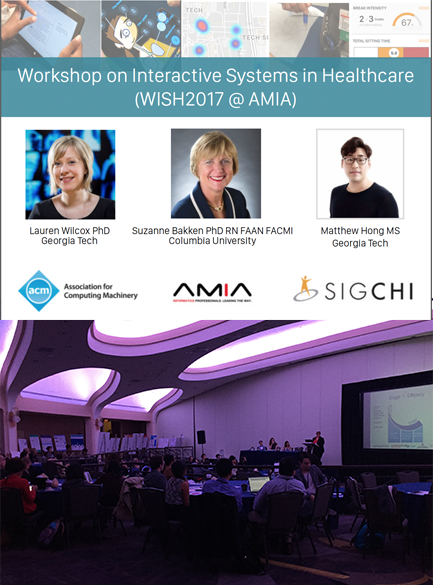 Nov 6th, 2017 Wilcox chaired the 7th Workshop on Interactive Systems in Health Care, held at the American Medical Informatics Association (AMIA) 2017 Symposium. The event brought together over 100 participants to explore issues at the intersection of Human–Computer Interaction and Medical Informatics. The WISH program is now available! All papers made available by the authors are up on the WISH website: http://wish.gatech.edu. To stay on top of our next steps, join us here! Sep 20th, 2017 The Hx Lab will participate in the GVU 25th Anniversary event Oct 18-19! 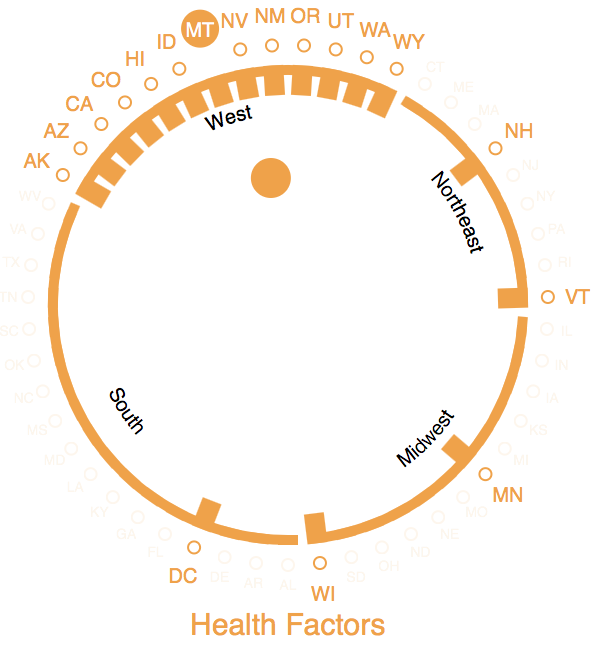 Matt Hong will present a visualization of health disparities in the U.S. and Clayton Feustel will present Rapport our tool for producing patient-friendly radiology reports. Stop by our lab to check them out. 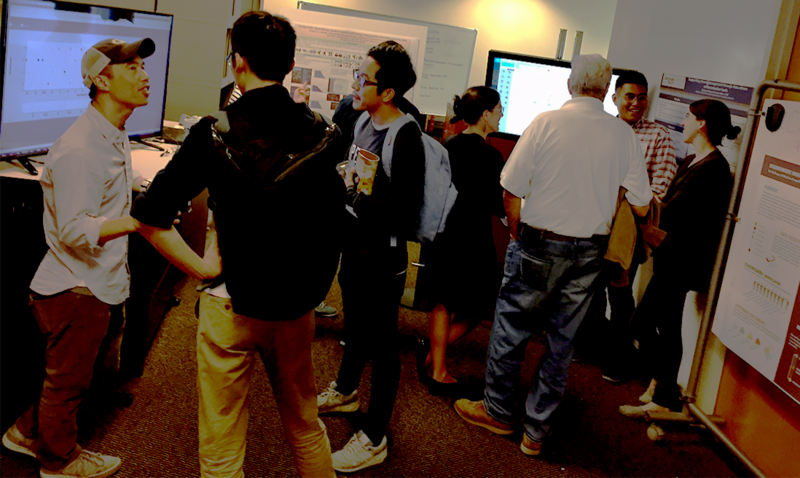 Aug 29th, 2017 Clayton Feustel and Matt Hong represented the Hx Lab in both the Undergraduate Research Opportunities in Computing (UROC) job fair AND the Undergraduate Research Opportunities Program research fair! If you are an undergraduate who is interested in getting involved in our research, stop by our lab or reach out to one of us by email! Aug 23rd, 2017 Wilcox's new course Personal Health Informatics was featured in the GT News as one of six Interesting Classes Students Are Taking This Fall. The course reviews emerging trends in personal health sensing and monitoring and includes both a graduate and an undergraduate section. Aug 17th, 2017 PI Mary Beth Weber (Emory University) and Co-PI Lauren Wilcox will receive funding from the Georgia Center for Diabetes Translation Research (GCDTR) Pilot & Feasibility Pilot Award Program for their proposal, Mobile Health Based Type 2 Diabetes Management in South Asian Immigrants with Arshed Quyyumi (Co-I), Heval Mohamed Kelli (Co-I) and Yi-An Ko (Co-I). May 26th, 2017 Wilcox will serve on the Health, Accessibility, and Aging subcommittee for ACM CHI 2018. Apr 29th, 2017 Special congratulations to the MS-HCI graduates who were awarded Best Project or Best Project Runner-up awards! Congratulations to Alex Ryan, of the Hx Lab, for being recognized for his MS-HCI project “Stand Up” Wearable Sensing and User Interfaces for Improving Sit–Stand Transitions. Apr 25th, 2017 Clayton Feustel and Lauren Wilcox will present their workshop paper, “Utilizing Multi-Modal Personal Health Tracking and Health Affordances of the Built Environment” at the People, Personal Data and the Built Environment workshop at DIS 2017. More about GT's exciting Smart Cities effort in the Horizon magazine. 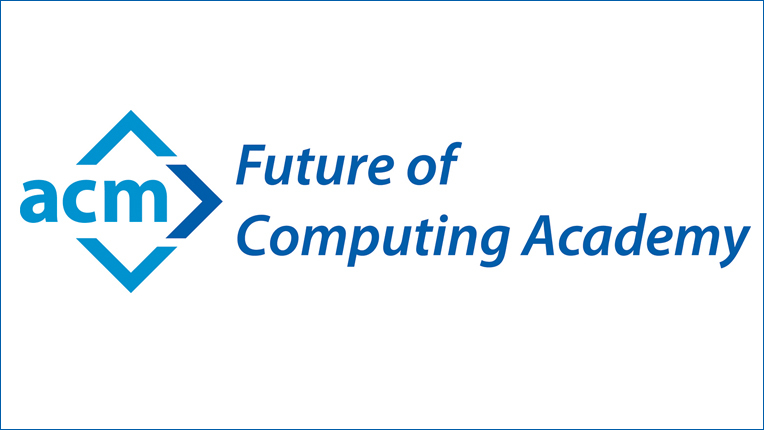 Apr 22nd, 2017 Wilcox has been selected to participate in the ACM Future of Computing Academy. She will join an inaugural class of early career computing professionals, to shape the academy’s governance structure and agenda and will attend the ACM celebration of 50 years of Turing Awards. Apr 10th, 2017 Wilcox will serve as general chair of the Workshop on Interactive Systems in Healthcare at AMIA 2017. She will serve alongside Suzanne Bakken, PhD, RN, FAAN, FACMI to oversee the 7th annual workshop. Feb 10th, 2017 Wilcox received the NSF CAREER Award for her proposal, “Adaptive, Collaborative User Interfaces for Chronically Ill Adolescents’ Personal Data Management.” The award will support research investigating how computational tools can be designed and developed to support collaborative generation and management of everyday, health-related data. Read a write-up of the news here. Jan 16th, 2017 Wilcox will co-chair the Leveraging Patient-Generated Data for Collaborative Decision Making in Healthcare workshop at the International Conference on Pervasive Computing Technologies for Healthcare (PervasiveHealth 2017) May 23rd, 2017 in Barcelona, Spain. Nov 8th, 2016 Wilcox will visit the Interactive and Social Computing group at the University of Michigan on 11/22/2016 to give a talk highlighting research in the Hx Lab. 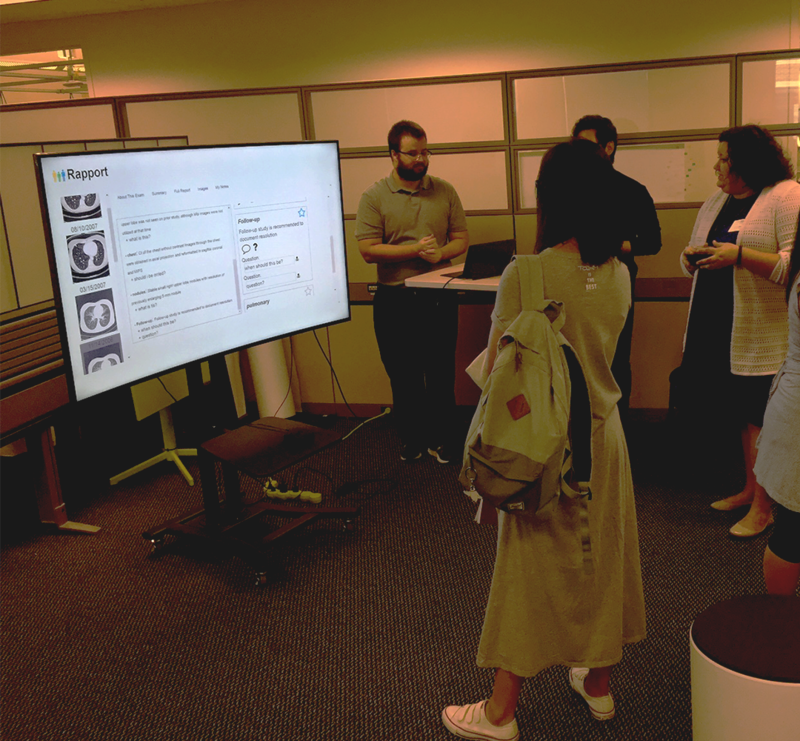 Oct 29th, 2016 The Hx Lab presented demos of our Rapport prototype at the GVU Fall Research Showcase. Oct 29th, 2016 The Hx Lab presented our work on the Quantified Campus/CampusLife project at the GVU Fall Research Showcase. Oct 8th, 2016 Wilcox will serve on the Technical Program Committee for the 11th International Conference on Pervasive Computing Technologies for Healthcare (Pervasive Health 2017). 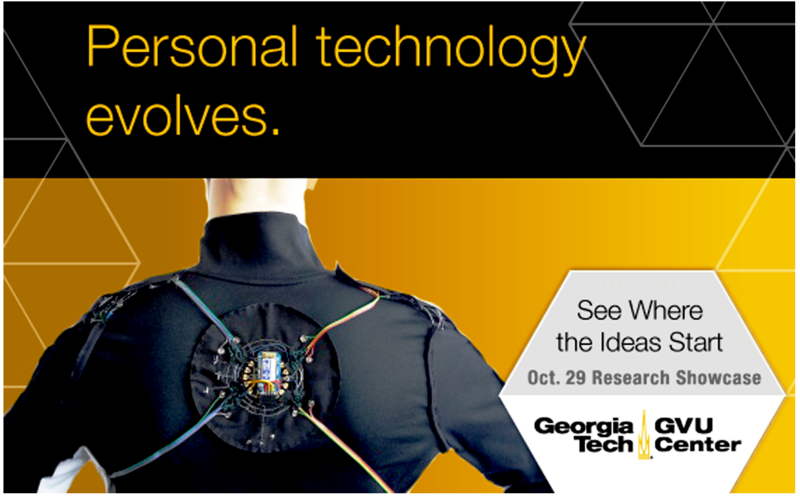 Oct 7th, 2016 The Hx Lab will particiate in the GVU Research Showcase! Come check us out at the event on 10/21 (345 TSRB)!! Jun 27th, 2016 Wilcox looks forward to participating in the Class of 1969 Teaching Fellows program at Georgia Tech, for the 2016-17 academic year. Jun 23rd, 2016 Wilcox will participate as a mentor in the Student Opportunity Lab (SOL) at the 2016 Grace Hopper Celebration of Women in Computing. She will also serve as a poster judge for the Student Research Competition. GHC will take place in Houston, Texas this year on October 19th-21st. Jun 21st, 2016 Wilcox will participate in the new Georgia Diabetes Translation Research Center funded by the Natio nal Institute of Diabetes and Digestive and Kidney Diseases (NIDDK). The center, comprising Emory University, Georgia Tech and Morehouse School of Medicine, will join a group of only seven funded centers around the country. Jun 1st, 2016 Matthew Hong was selected to participate in the Health Data Exploration Project's 2016 Summer Institute. The intensive training institute focuses on research methods for working with personal health data. It includes participants from a variety of relevant disciplines including public health, medicine, informatics, human-computer interaction, computer science, data science, and design. Mar 1st, 2016 CS PhD student Christina Kelley received an Honorable Mention for her NSF Graduate Research Fellowship Proposal. She will receive enhanced access to cyberinfrastructure resources including supercomputing time in support of her research. Jan 3rd, 2016 Wilcox will serve the Scientific Program Committee (SPC) for the AMIA 2016 Annual Symposium. Dec 15th, 2015 Thank you AIG Science for a gift award to seed research on mobile pain management interventions. 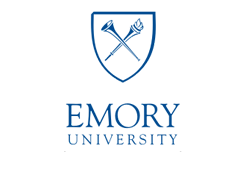 Oct 9th, 2015 Wilcox will serve on the Technical Program Committee for the 10th International Conference on Pervasive Computing Technologies for Healthcare (Pervasive Health 2016). Apr 7th, 2015 Wilcox will serve on the Specific Application Areas subcommittee for ACM CHI 2016. Mar 8th, 2015 Wilcox was awarded the NSF CRII Grant for her proposal, "Novel User Interfaces for Reporting Personal Health Data to Lay Individuals" through the Smart and Connected Health program and CISE Research Initiation Initiative (CRII) with an expected start date of April 1st. Jun 16th, 2014 Wilcox will receive a Georgia Tech/IPaT and Children's Healthcare of Atlanta research grant, with Aarti Sekhar, MD at Emory Healthcare and Stephen Simoneaux, MD at Children's Healthcare of Atlanta (CHOA) to investigate how access to pediatric radiology reports can be broadened to include a care community consisting of patients and their family members. Our research pursues insights into how family members of pediatric patients interact with the CHOA Personal Health Record (PHR) portal to access and utilize diagnostic radiology reports along with other forms of diagnostic testing. 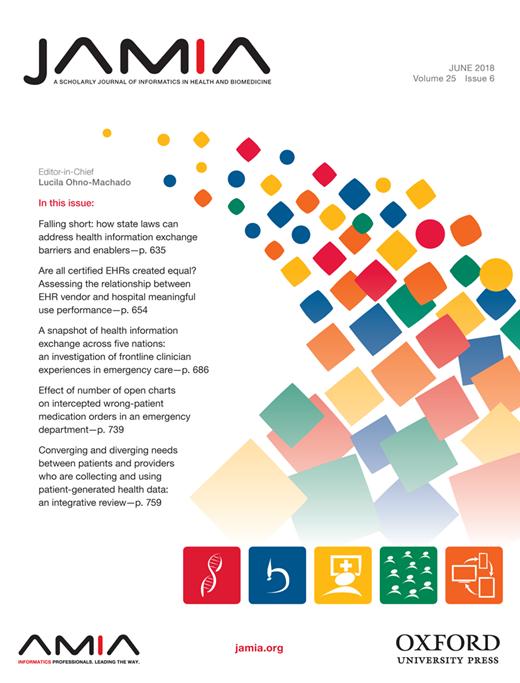 We are studying how access to this information subsequently impacts patient-provider communication: how information is shared among patients and their care team in practice and how the portal can be used to deliver these reports while educating and engaging pediatric patients and their families.